Something that nobody wants is bad breath. It can be embarrassing, especially when you interact with others. 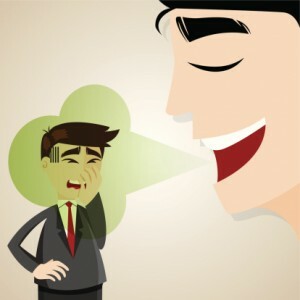 When you want to make a memorable first impression, having bad breath is a way to do so, but not in a positive way. Though you may have tried conventional methods to tackle your bad breath, also known as halitosis, you may have found that nothing seemed to work. Dr. Khalida Stutman, Dr. Dory Stutman, and Dr. William Rubino want you to feel confident in all aspects of your smile, and they have some advice for those living with halitosis. One of the simplest things someone can do to handle their halitosis is following an effective oral care routine. People may underestimate the importance and benefits of brushing and flossing their teeth every day, and not doing so can definitely affect the way your breath smells. Your mouth is home to millions of bacteria, and when they are able to multiply and grow, they can wreak havoc on your smile, affecting your breath. Brushing your teeth and tongue, as well as flossing your teeth every day can definitely contribute to having fresher breath. Also, investing in a reliable antibacterial mouthwash can help with your halitosis, ensuring your breath stays fresh. Another simple thing you can do to ensure fresh breath is visit our office every six months for your dental checkup. During your checkup, it allows our doctors to look for any problems, such as tooth decay, that can affect the way your breath smells. With our doctors taking the time to clean your smile and remove the harmful bacteria, you are able to have a healthy smile and clean breath! If you are not sure if you are living with halitosis, a couple of signs are a constant bad taste in your mouth and continuous dry mouth. Keeping these tips in mind, there is no doubt you will be headed down a road to having a healthier smile and fresher breath!